This blue-chip recruit chose BYU over Stanford and MIT. All-star athletes travel to universities around the country, hosted by recruiters hoping to sign them. One such trip last year courted a BYU athlete of a different sort. As the 2006 national high school champion, freshman Sam Dittmer (’14) came to Provo from Zionsville, Ind., as the no. 1 recruit. In this case, however, it was BYU’s mathematics program that wanted Dittmer to enroll. Designated “Mr. Math” by the governor of Indiana, Dittmer grew up playing games based on complex math principles devised by his older brother Andrew Dittmer, who is now studying for his PhD in mathematics at Harvard. 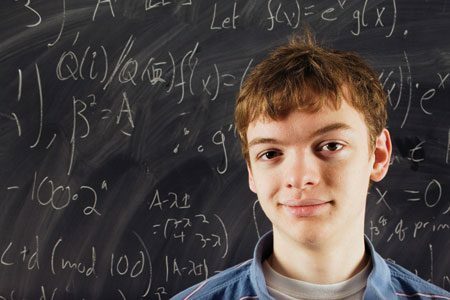 As a high school sophomore, Dittmer won the 2006 American Regions Mathematics League Competition—an event that brings together the nation’s top math students—by being the only contestant to correctly solve all eight problems in the final round. Despite his successes, the laid-back freshman is mostly unfazed. “One of the nice things about math is that you can’t get too much into the celebrity of it, because there isn’t that much celebrity about it,” Dittmer says, holding a chocolate donut with sprinkles—a staple in his diet at the Cannon Center. At BYU, Dittmer joins the university’s unofficial math team—a handful of upper-level math students who prepare for the world-renowned Putnam Math Competition held each year. On a Tuesday afternoon, he sits with four teammates in a Talmage Building classroom with chalkboards on three walls. Hunched over, fingers to forehead, Dittmer pores over lined pages filled with n’s and i’s squared and cubed all the way to infinity. When they come to a dead end, Dittmer strides confidently to the chalkboard. “I have an idea, but I might have to think as I go. It might be problematic, so correct me if I say anything ridiculous,” he jokes dryly. Next May he’ll be headed on a mission, but this math star isn’t worried about losing his touch after two years in the field. “It’s like riding a bike,” Dittmer says. “There will be things like facts you’ll forget, but the manner of thinking, that’s not something you really lose.” Until then Dittmer plans on savoring the freshman experience—he hasn’t gone to bed before 2 a.m. since school began.